The middle school program strives to encourage independent and critical thinking across all subject areas. Each student is viewed as an individual who brings different experiences, ideas, interests, and learning styles to the classroom. Students take on a more active role in organizing and planning their daily school routine, taking ownership of their learning experience as well as understanding their role as leaders within the school community. Collaboration and creative thought are encouraged as students participate in real-world discussions and problem-solve. Students can choose one of four workshops: Technology Trends, Drama, Woodshop, and Math + Art = String Art. Students work in groups by grade level to solve and construct three engineering challenges. Past challenges have included bridge construction, rockets, parachute egg drop, glider planes, and catapults to name a few. 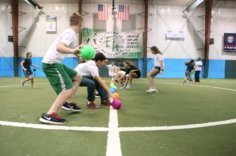 Students then compete at grade level. Hilltop’s Student Council was recognized by the National Association of Student Councils as a Gold Council of Excellence. 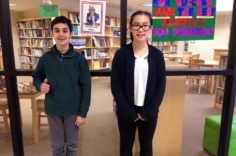 Hilltop’s council is led by elected members of the eighth grade class and representatives from students in grades four through eight. During the 2016-17 school year the council donated more than $1,500 to The Seeing Eye. These funds were raised through a number of Dress Down Day fundraisers. The Student Council also plans several social events throughout the year including movie nights, holiday parties and a spring carnival. 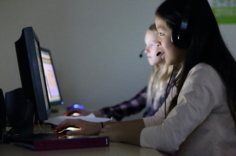 Our World Language program features the Berlitz Virtual Classroom. Berlitz programs are highly engaging and interactive, requiring students to participate actively. Research has shown that Berlitz students accomplish what students in a traditional World Language classroom do in half the time. Our students have many leadership opportunities including Student Council and Peer Leaders. During physical education classes Upper School students, beginning in Grade 5, will be able to participate in sports such as soccer, basketball, hockey, volleyball, and track and field/cross country at The Fieldhouse at the Sparta Athletic Campus, a 24,000 sq ft. multi-sport and activity complex with a high quality indoor turf surface. All students in the Upper School participate in Hilltop’s Science Night Exhibitions. A weekly class in Makerspace allows students to create theories, use trial and error as they collaborate and invent. 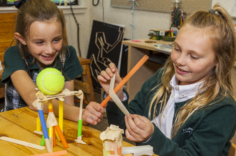 Through hands-on learning, the Makerspace is yet another area where Hilltop students will have opportunities to develop an inquiring mind and be asked to imagine, build, design, prototype and make.